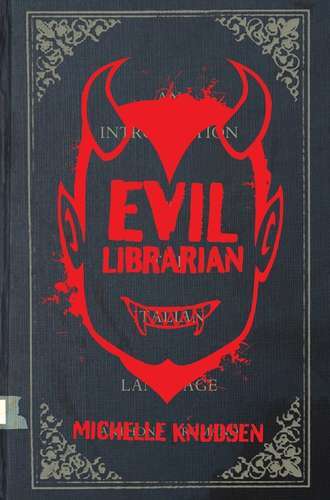 I bought Evil Librarian by Michelle Knudsen through one of those Kindle deals, and it sat on my e-reader for a while. I love weeding through my Kindle holdings and finding treasures like this one. There's a lot about Evil Librarian that deals with teenage crushes. This is normally a subject that I couldn't tolerate for more than a few paragraphs. Who am I kidding? I couldn't tolerate it for more than a few sentences. But it works here. Mr. Gabriel, the new, incredibly hot librarian at Cynthia Rothchild's high school, is a demon from a place very much like hell, though not. He's at the high school to steal juiciness from the young, use people mojo as part of a plot to take over demonville, and hook himself a human, teenage bride. Being young and hot and a demon, Mr. Gabriel is able to overcome all around him, particularly the students. Except for Cyn who is the rare human who is not susceptible to demons. So you've got your demon fighting thing going on at the same time your teenage "does he love me, because I love him!" thing is happening. What makes this work is that while the fight against evil is happening, teen life goes on. The love angle isn't so much love, as it is uncontrollable drive. It cannot be stopped. Some little quibbles with logic: The body count keeps going up and no one notices? I can see the demon being able to control what's perceived within the school, but what about those outside the school? Surely they would be aware that someone didn't come home from work. Also, parents are conveniently uninterested and unavailable here. They would have been all over opening night of that play. But, hey, this is a witty and clever book about demons. You have to let some things go. It sounds as if a sequel is planned, though I haven't seen anything about it on-line. I'll have to keep an eye out for this one! I got the eBook in some kind of Kindle deal. I was vaguely aware of the title, but I would have missed it otherwise.